A shootout that killed an opposition activist cast a shadow over Albania's crucial general election on Sunday, with both sides claiming victory in a vote that could determine whether one of Europe's poorest countries has a chance of joining the EU. The first official preliminary results for the election of the lawmakers for the 140-seat assembly were expected on Monday or no later than 72 hours after the polls close, as mandated by the law. But the electoral commission -- the agency in charge of certifying results -- remains paralysed as it has not yet replaced three of its seven members who quit in April over a dispute between the government and the opposition. In the absence of preliminary results, the ruling coalition of outgoing Prime Minister Sali Berisha and his rival Socialist leader Edi Rama both told supporters they had won. "The Renaissance has won," said Rama, the 48-year-old former mayor of Tirana, of his leftist coalition. The Socialists based their claims on the exit poll released by a private TV station which said that Rama's coalition was leading the vote with 55.5 percent compared to 43.5 won by Berisha's bloc. But just a few blocks away, Berisha told reporters in his Democratic party headquarters that he was "convinced of our great victory." Berisha's party quoted an exit poll carried out by a private research group which said their coalition led the vote with 48 percent, compared to their rivals with 46 percent. Outside, several dozen youngsters waved blue party flags, shouting "Berisha! Berisha!" and "Victory!" But fears of violence were high after a 53-year-old activist in Rama's coalition was killed in a shootout in the northern town of Lac. Police said a rival candidate for parliament from Berisha's party was wounded along with two others. A police spokeswoman said the shootout "might be related to the vote" and had started with an "argument." Police detained seven people after the incident, she said. Rama branded the shooting a "serious political incident... aimed at intimidating the voters." "Berisha should take responsibility... and pay for it," Rama told reporters after rushing to Lac. Brussels, which has twice rejected Tirana's EU membership application, said Sunday's polls "represent a crucial test for the country's democratic institutions and its progress towards the European Union". Having failed to deliver clean elections since the fall of communism two decades ago, Albania desperately needs to prove that it is able to hold fair polls that meet international standards if it is to have a shot at joining the European bloc. Both sides have been accusing each other of vote-buying and electoral roll irregularities, raising concerns there could be a repeat of the 2009 polls which triggered months of political turmoil and government paralysis. Central Electoral Commission said it had allowed several polling stations to remain open after the 1700 GMT closing time as some of the 3.2 million eligible voters were still waiting to cast their ballots. "In Albania, everyone is so obsessed with politics, they think of it even when they make love," said voter Arsen Prifit, a 30-year-old engineer. Conservative Berisha, seeking his third mandate to lead the Muslim majority nation after eight years in power, has vowed that "the will of the citizens shall be respected". Both Rama and Berisha have pledged to improve living standards in the country where many, especially in the poor mountainous north, depend heavily on financial aid sent by an estimated 1.5 million countrymen living in Western Europe and the United States. Berisha, a 69-year old cardiologist, has been campaigning on the promise of new investments, and also a six percent hike in wages and pensions to take effect after the election. Rama, a Paris-schooled painter, has insisted on rooting out widespread corruption in Albania, which ranked 113th of 174 countries on graft watchdog Transparency International's 2012 list. 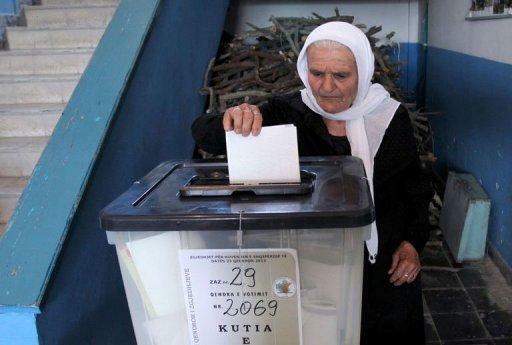 An Albanian woman casts her vote at a polling station in the village of Fushas, near Tirana, on June 23, 2013. A shootout that killed an opposition activist cast a shadow over Albania's crucial general election on Sunday, with both sides claiming victory in a vote that could determine whether one of Europe's poorest countries has a chance of joining the EU. 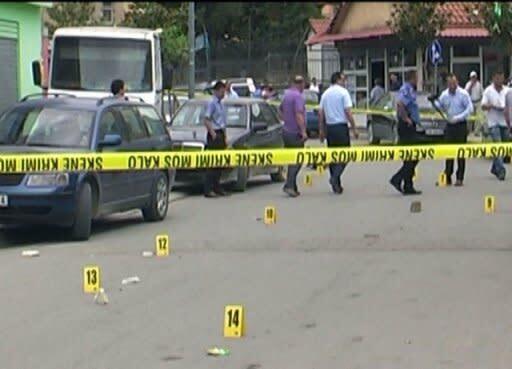 An image grab taken from a video provided by the Albanian Broadcasting Corporation shows a police cordon near a polling station in Lac, some 60 km northwest of Tirana, on June 23, 2013. 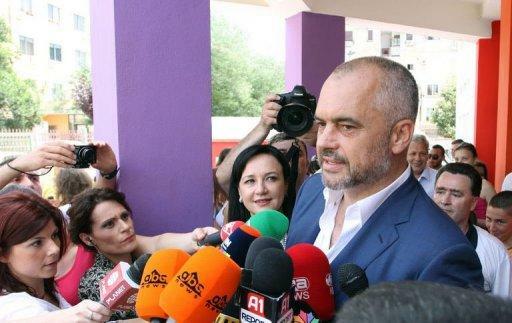 Albanian Socialist Party leader Edi Rama speaks to the media after casting his ballot at a polling station in Tirana on June 23, 2013. Albanian Prime Minister and Democratic Party leader Sali Berisha makes a victory sign as he casts his ballot at a polling station in Tirana on June 23, 2013.